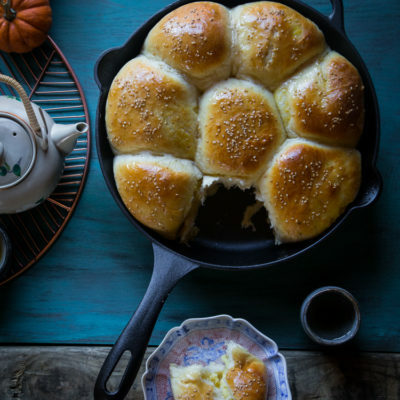 Pumpkin custard milk buns are so soft and fluffy, they just blow my mind! 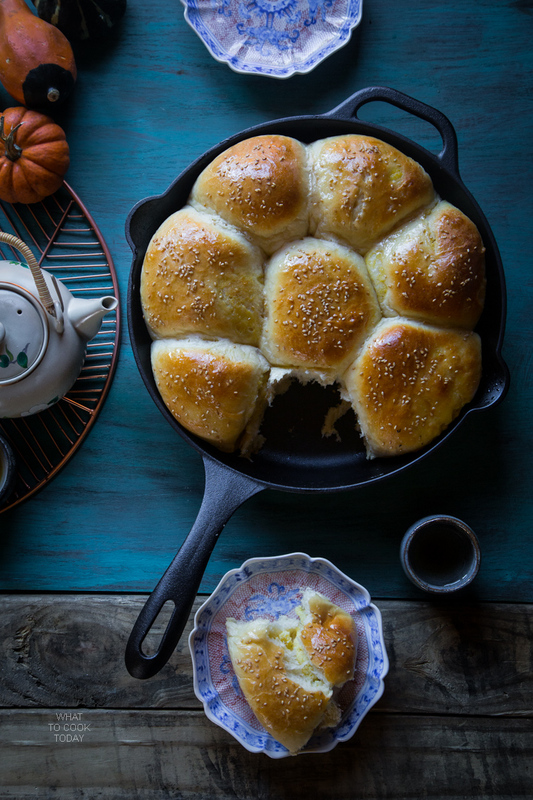 The buns are made using water roux (Tang Zhong) method and filled with delicious creamy custard. My dad was a huge fan of bread, cakes, pastries, and pretty much all the other sweet treats too. I remember having wide varieties of mini cakes, buns, breads, Indonesian kue kue for afternoon snacks everyday. He would go to his favorite bakery shop and brought home loads of these good stuff. My mom is a great cook, but she is never a baker nor does she has any interest in sweets at all. She’s probably one of the very few people I know that doesn’t care much for any cakes and sweets. Yeah…they are the polar opposites. I’m truly not a baker. Honestly, I love to cook more than baking. Baking required precision, which I just don’t have!! I’m a pinch of this and that person. Lately though I’ve enjoyed baking more and more. I’m still a horrible baker, but few success such as croissants, brioche, and French macarons have given me some confidence to explore more in the baking department. 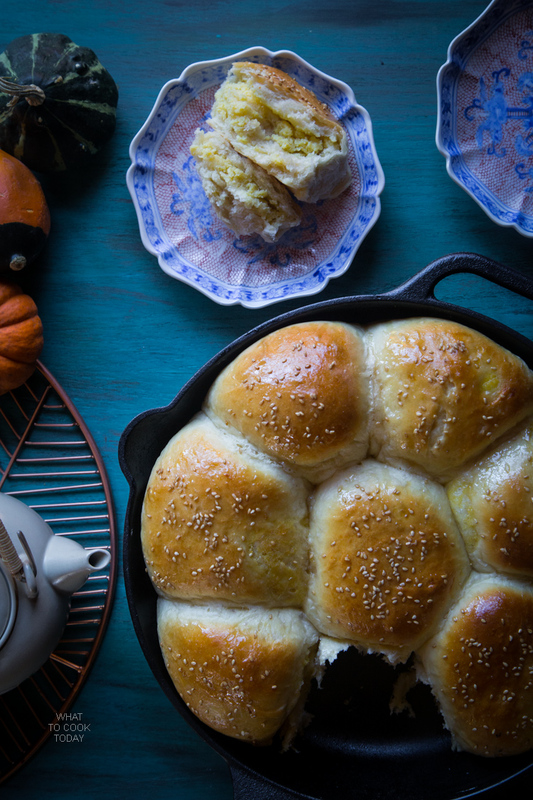 Pumpkin is abundance this time of the year and so I thought I want to make some Asian-style pumpkin custard buns. 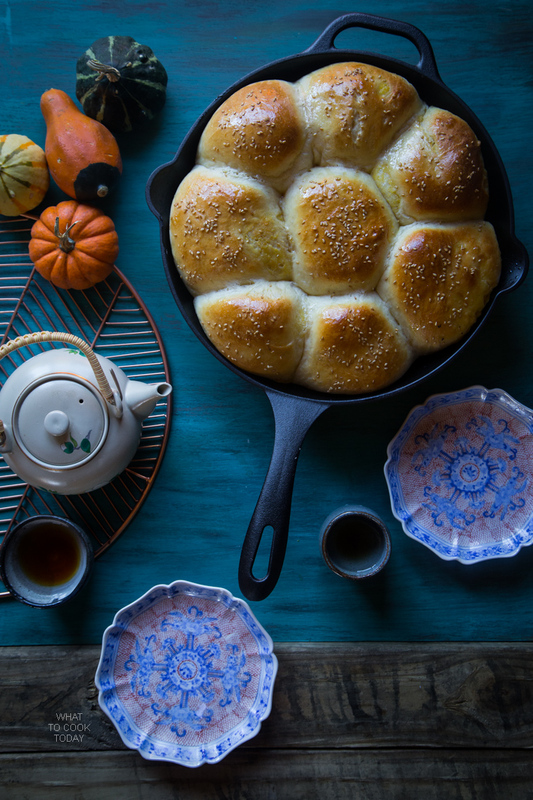 These buns are made using Tang Zhong method (water roux starter). 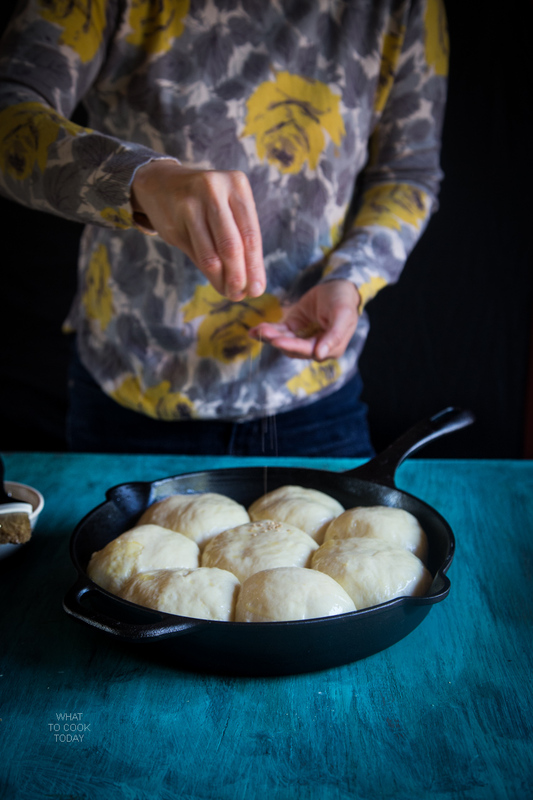 From what I read, this method comes from Japan and it helps to keep your baked bread and buns soft and fluffy, even after days. It’s truly a game changer for me. It’s basically a mixture of water and flour cooked into paste and then mix into the dough. A little bit extra work, but SOOOOO worth it!!! You can read more about it from this Soft and fluffy Hokkaido Milk Bread. 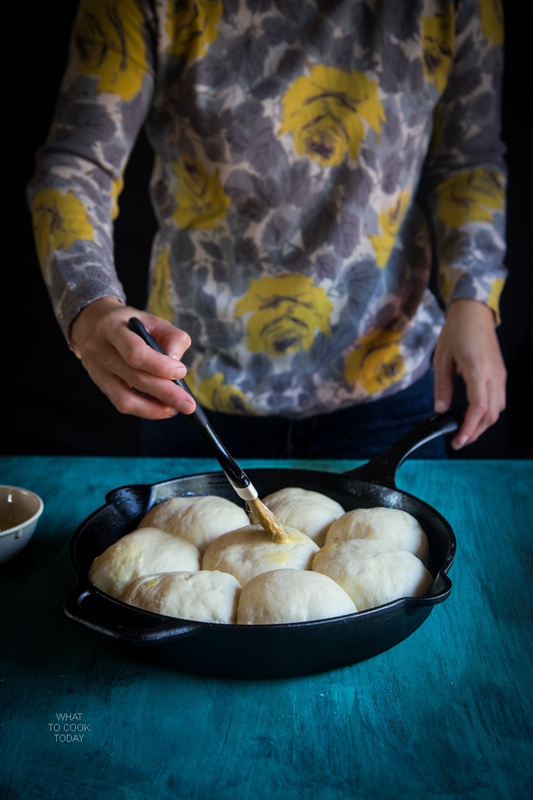 I baked the buns in this gorgeous 12-inch cast-iron skillet by Victoria Cookware. Seriously, the best decision I’ve ever made. The even heat distribution from cast-iron gives these buns their nice color and the bottom is not over browned and overbaked, which is almost always the case when I use my regular baking pan. The skillet feels very substantial and you know it is of high-quality and made in Columbia. I’m so used to U.S measurements when it comes to cooking, but I’ve learned that when it comes to baking, the metric measurements help me to be more precise. So, that’s why I like to use the metric measurement now. It’s incredible how soft and fluffy these buns are. 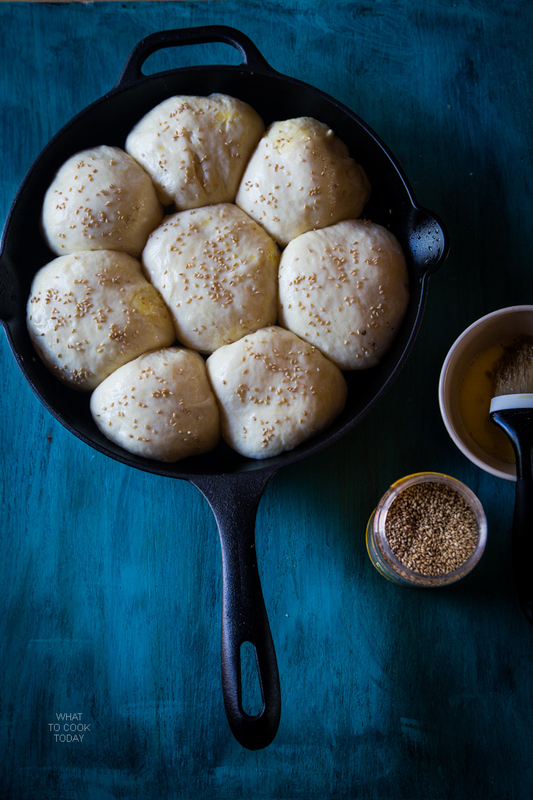 The kids love these buns so much. It’s time to make more!! Thank you so much Victoria Cookware for the 12″ cast-iron skillet. It will be put into many good uses in this house for many years to come! Nothing better than hot baked buns from the oven, warm and tasty. Yum! These buns are absolutely gorgeous! I love baking but I have to admit bread baking is not my forte. I am so intrigued with this Tang Zhong method, I’ll definitely need to read more about it! Hi, I made these yesterday, just as the recipe said, but without the pumpkin. They were awesome! The first rising was a little slow, and after 90+ minutes I made an executive decision to move to the second rising. It may have been because of the humidity that day, who knows. But the second rising was right on schedule and the buns came out just like they did above. I may have overbaked them a tad, in my new stoneware baking dish, but next time I will adjust the timing. Thanks Marvellina! Amazing recipe. Easy to follow and tastes incredible. First time trying a recipe from this blog and definitely will continue.